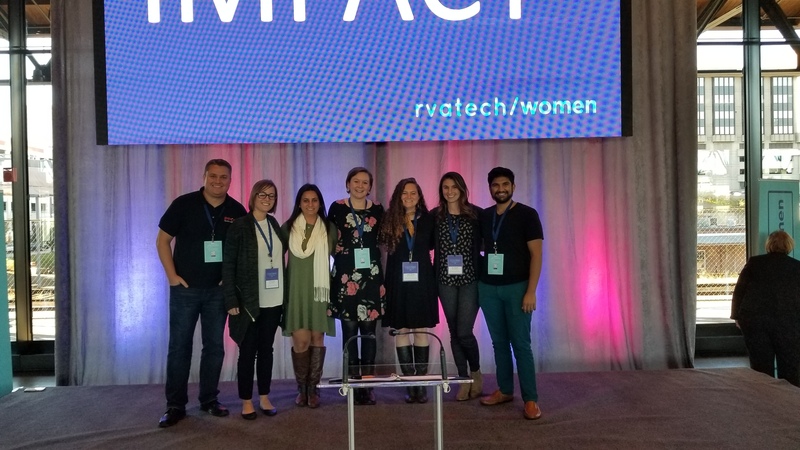 On October 18, 2018, six of IpponRVA's consultants attended the RVATech Women in Technology conference here in Richmond Virginia. As advertised, "Central Virginia's premier technology conference brings together professionals on a wide range of technology topics to learn, network, and collaborate." After attending the conference and discussing the day at the conference happy hour we decided that we should share our opinions of the day with the world, or whomever would listen! It was advised, and properly so, that the ramblings of six women and their experience at a conference may be a bit overwhelming to society, so we broke this inspirational knowledge fest into a two-parter. We hope that you find something here to inspire you, regardless of gender, to go out into the world and make a difference, even if that difference is solely introspective. We have done our best to carry on the essence of the conference within our tales and more importantly bring along our own experiences in order to offer some sort of guidance if you are here to seek it. Although we do not speak for RVATech or all women, we do speak as six women IN technology from various backgrounds, points in our careers, and stylistic preferences. Take what you want, leave what you don't and comments or feedback are encouraged! If you haven't done so, make sure to also read part 1 first! Shouts of "Brilliant!" punctuated the RVA tech Women's conference as attendees appreciated ideas/lessons from the speakers and panelists. Personal Branding was the topic of both a breakout panel session and a talk. As a panelist said, "It is no longer what you know or even who you know, it's who knows you. "This message was reiterated by the panelists who spoke of growth and job opportunities being presented to them through their networks based on others' knowledge and perception of them. Dealing with a bit of an impostor syndrome, personal branding seems daunting to me. But if we consider personal brand to be what folks say about you when you're not in the room, it is out there already. The question is how to actively curate it to be how we want to be perceived. Authenticity: This was a recurring theme. Be authentic to who you are or it comes across as disingenuous and can have a negative effect. You have to be able to back up what you're selling! Strategy: Use Gap Analysis of current state and end goal and make a plan on how to get there. Actively position yourself for the role you want. Use networking and take risks to present or speak to reach a wider audience. Write blogs or posts on social media to showcase knowledge, experience and interests and digitize your accomplishments. Differentiation: Highlight your strengths and what you bring to the table. Brag more. What's your personal elevator pitch? When changing your brand, purge or highlight intelligently. Personal Branding cannot be a one-and done step or only at the time of ajob hunt. It has to be a continuous process. The Necessary Inclusion session had Diversity in IT statistics that were concerning and a question and answer session that was inspiring. The speaker stressed the importance of every Voice (How do women with long nails navigate touchscreens?) in the room.For those worried about coming across as too shrill or whatever stereotype, Ms Rivers simply and powerfully said, "Come Anyway." Speaking of allies in the room, shoutout to my Ippon colleagues for saving a lunchbox for me when this new mom had to go to the Ippon office during the break! "What's your impact?" As someone whose job revolves around collecting and presenting metrics to assess the impact of business decisions, it took this conference to ask it of myself along with the related question of "What is your purpose?" As the amazing MC so passionately said and I'm paraphrasing: "You are not your to-do list! What is your purpose? Even a hair tie has a purpose!" I would highly recommend attending the conference as it is inspiring, empowering and, along with all the fuzzy, good stuff, gives a lot of food for thought and, more importantly, action. The RVA Tech Women's conference was a great success this year. Despite the noisy echos during the sessions (my only real complaint), I learned a lot and left with new knowledge and realizations about myself and my career. I think I can say the same for everyone in my group, but I'll let them tell you about that! I am a woman whose primary short-term, day-to-day goals involve a lot of coding. I am not always surrounded by other women with these same goals, though that is continually changing, thankfully. So, for me to watch another woman who has built a successful life on her coding and analytical research skills, stand up and discuss her findings, was extremely impactful.Nancy Douyon's keynote was undeniably my favorite part of the conference. I loved hearing her proving out the serious business and financial disadvantages to creating products without addressing various pertinent facets of user design such as personal bias and underrepresented groups. As an incredible technical influencer and current lead of UX at Uber, Nancy had some powerful stories. Listening to her, it felt special and unique to think, "Wow, I would like to impact someone the way she just impacted me". After reflecting on her talk, I realized it was the culmination of the day, ending with her awesome keynote, that left me in such a reflective state. One of the things earlier in the day I heard (and really liked) was to choose 10 women and make it your responsibility, make it part of your goal-setting, to ensure those 10 women are successful. No matter where they are in their lives. I immediately thought about my family and friends and tried to make a list of people that, even if I feel unable to keep up socially, I should be able to make the commitment to talk to them about their lives and try to help them: be successful, be happy, and make the impact they want to make, however I can. I reflected on another big piece from the day leading up to the Duoyon's keynote: the concept of personal branding. It was interesting how I found some of the topics to be both clarifying and mystifying at the same time. For example, gap analysis; i.e figure out your desired future state, identify your realistic current state, and develop a plan to get from A to B. I started to do this for my own life but came up short in my inability to pinpoint exactly what I would like for my desired future state. Throughout the day I realized that in order to figure out where you want to be you have to look at where you are now, and develop a set of values and goals that you'd like to work towards. Finally, towards the close of the conference I had such a strong feeling that I would like to be able to reach another coder like Nancy reached me during her keynote, I started to think about how I might develop a desired future state. Since then I've decided to write down my future goals, along with a set of values (as genuine and authentic as possible) . Naturally, as my current state changes, so can my goals and values, but I will strive to be deliberate about my decisions and focused in my actions. I really enjoyed this conference, and think there were parts of it that resonated with every person in the room. Maybe the most obvious yet important thing I got from the conference was time for directed self-reflection during the talks. This conference forced me to think about where I am now, who I want to be and how to get there, and ultimately who, where, and how I want to impact. This was my first RVA Tech Women's conference and I didn't know what to expect but I left feeling empowered and inspired. It was hard not to: over 600 women and men attended the sold-out event celebrating women in technology. Talks varied from DISC personalities and communication, to the need for more diversity in tech. There were breakout sessions on developing a personal brand of authenticity and then a keynote on honing that personal brand and understanding your brand may need to lose five pounds. And that's when I got a little lost. The idea of losing 5 pounds, or getting a makeover for a job seemed a direct counterpoint to what many at this conference seemed to be striving for, especially when advice for male executives were line items like entering politics or participating more in thought leadership. But it was this talk that helped me find the common threads of authenticity, diversity, inclusion and empathy that tied the conference together for me. The first speaker of the day, Kate Foster, pulled apart the DISC-assessment and talked about how we can recognize different personalities and tools we can use to communicate with those personalities to have the biggest impact. With ⅓ of projects failing from communication it's important to know your audience, and really know your team and how to communicate, and create the best interactions possible on all sides. Arvis Yates Rivers, author of Necessary Inclusion, showed some sobering stats emphasizing the need for diversity in the tech industry. Women make up 53% of the workforce but 26% of tech and when we drill down to black and hispanic women the numbers are even smaller. In between each of these speakers, Casey Ferrell, the host, kept things moving. She encouraged everyone to get excited, to connect with each other, to be positive and try to reach out to others at the conference to help and support one another. And she also emphasized being kind to yourself. She wore her to-do list, to show that we all feel bogged down, we have so much going on, but we need to take care of ourselves. Breakout sessions happened before and after lunch. The first one I attended "The Shape of you - Building Your Personal Brand" was a panel of four women discussing how to build and maintain your brand. The panel kept reiterating that authenticity leads your brand identity, and that connections are key. To be true to yourself and to find your tribe online, and off. The latter session "What are you Thinking?" was a workshop for creating Opportunity Trees. The exercise showed that while a stakeholder might think they know what they want, reframing the question of why and creating a desired outcome could lead to other opportunities and solutions. Again it was all listening, communicating, interviews and learning about needs. Nancy Douyon closed the conferencewith "Humanizing Usability Through Inclusive Design in Tech." Having the head of Uber's International Research Platforms close out the conference by talking about designing with empathy, and explaining the empathy ROI summed up the common themes while showing how much impact they can have in action. She explained that Uber needed to stop thinking of designing for a Western Market when most of Uber is being used outside the US. She did this by turning her assumptions into questions. And she firmly believes in trying to incorporate underrepresentation from the beginning of the project to bring out the best outcomes. So there are five different talks and one host, repeating the same things. Let's get everyone to the table and try and have better conversations. My background is in design and it's been hard to find footing in an industry that's always changing and one that's not always so female friendly. Which is why these conferences, these speakers are so refreshing to hear. I think in this new world of thinking about yourself as a brand it's really easy to feel like an imposter. It's really easy to feel you don't know enough or don't fit somewhere. It's even easy to feel like you need to lose five pounds, be thicker skinned, or get a makeover, and reinvent yourself. But it's really important to be reminded we all bring something special to the table and we are all supporting one another to find our own path. And there are people out there trying to better support one-another by improving our ways of looking, listening and thinking about our projects, our teams, and about each other. At the end of the day I just don't think the 5lb conversation is one worth having, but there are so many other worthwhile things we can be discussing in the now.